Q) What is the Display Size and resolution on the Samsung Galaxy J7 Duo? Q) What is a Processor on Samsung Galaxy J7 Duo? Q) Rear Camera on Samsung Galaxy J7 Duo? Q)Samsung Galaxy J7 Duo how much MP is the front camera? Q) Can Samsung Galaxy J7 Duo Record 4K Video? Q)Does Samsung Galaxy J7 Duo come with Touch capacitive buttons? Q)Does Samsung Galaxy J7 Duo have NFC? Q) What are sensors on Samsung Galaxy J7 Duo? Q) Does Samsung Galaxy J7 Duo has Dedicated MicroSD card slot? Q) Where is the fingerprint scanner on the Samsung Galaxy J7 Duo located? Q) Does the Samsung Galaxy J7 Duo support LTE and VoLTe? Will a Reliance Jio SIM work on the phone? Q) How much is Battery on Samsung Galaxy J7 Duo? Q) Connectivity options on Samsung Galaxy J7 Duo? Q) Dimensions of Samsung Galaxy J7 Duo? Q) Weight of Samsung Galaxy J7 Duo? Q) In which color Samsung Galaxy J7 Duo will be available? 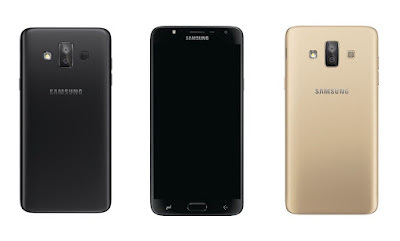 Q) Samsung Galaxy J7 Duo Price and where to Buy? A)Priced at Rs. 16990 and will be available across retail stores starting April 12th, 2018.